Since Magic League debuted with Kaladesh, we've learned a lot about what works for the format and what doesn't, what resonates with the intended audience and what falls flat, why some stores succeed and why some have trouble getting it off the ground. Do you assume players already understand it? The suggested League format is pretty simple. Start players with three boosters and sell them another each week, plus another after any set of three losses. They can track their own records and battle any time you’re open. Each week, report a League event in WER with everyone who played a League match. Simple as it is, League is still a newish program aimed at newish players. Getting players acclimated to the format—especially players just getting acclimated to Magic in general—means pitching it in the clearest possible terms. Decks include thirty cards instead of forty. Matches last one game instead of two. Players get one free mulligan per game. Do you split the casual audience? Every event Wizards offers is designed with a certain audience in mind. For League, that audience is brand new and almost-brand-new players. It's got appeal for everyone, but it's meant as an introduction to the habit of in-store Magic; something to get newcomers into the habit of playing in your store. A competing event aimed at the same audience could end up cannibalizing those players and sabotaging your League. Don't schedule any. Make your League meetup the casual audience's best and most obvious choice. Do you target competitive players? And how do you make that clear—that League is for casual play? Your prize pool has a lot to do with it. Generally, a large one will create a competitive vibe, a modest one will create more of a social experience. Both have their time and place, but it's the latter you want for Magic League. Too much competition and you risk scaring off the intended audience. Reward matches played, not matches won. Whatever rewards you choose to offer beyond the promo card, we recommend using them to encourage more matches, more play, more visits to the store. Do you make it seem like a big commitment? Given the four-week time span, some players get the impression that joining League means surrendering a good chunk of time—a weekly obligation. It's the opposite. Flexibility is part of Magic League's appeal. The time commitment is whatever players choose. Structure your League, from entry fee to payout, in a way that makes that clear. Players shouldn't feel any more obligation picking up League packs than they would feel picking up three packs on any other day. 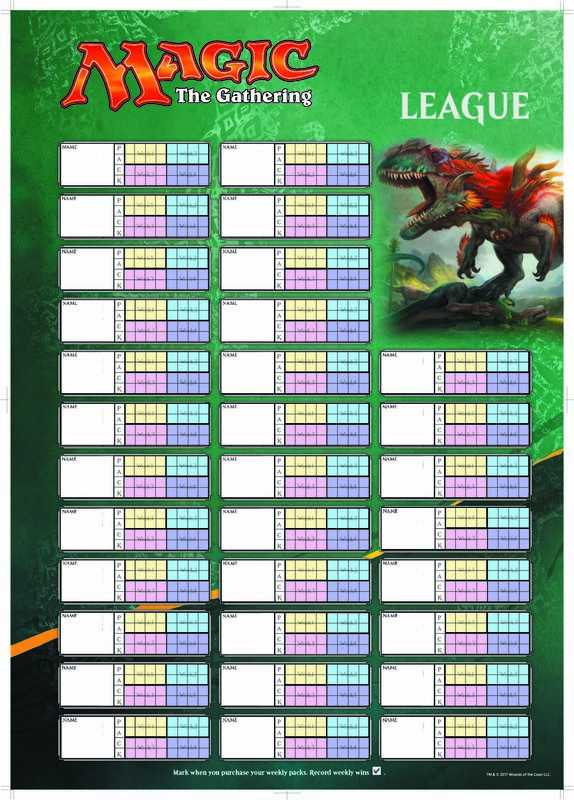 League starts today, and players can join in any time between now and the conclusion on February 17. Give your League its best chance of success by pitching it in the clearest possible terms, clearing your meetup event of any competing casual options, and focusing on social, low-pressure play.